My style has definitely changed and evolved a lot. I have to say, It has been through many, many phases between finally being allowed to dress myself as a child, to now being a grown woman who is aspiring to become a physician. That’s a lot of room for error. But that’s mostly how we learn, so I’ll take it all in stride, and embrace the bad fashion choices that have come, and (thankfully) gone. Really glad that is over now however. And I’m not looking back (unless I need a laugh). I’m looking forward now. And in looking forward, I realize that what’s in my closet is a little stuck in my past fashion sense. So I had the idea to do a complete cleanse and overhaul. Not everything will go, this is not a Kim and Kanye moment (remember when he got rid of all her stuff and bought her all new stuff). I am not Kim, and I do not have a Kanye. So this process will be quite slowly paced. And there are some stuff I have that I can work with, so I’ll definitely start there when I’m building again. I’ve learned a lot about how to dress myself (like how to make my 5′ 2″ frame not disappear in certain clothing and make me look like the shorty I actually am [6 Ways to Appear Taller]), and I just want my closet to reflect that. I want a wardrobe that reflects my current style and fashion sense. I want it to be minimal. Not a lot of stuff, but more things that do double or triple duty. I would like it to be classic, with articles that are timeless and will look good season to season. SO. 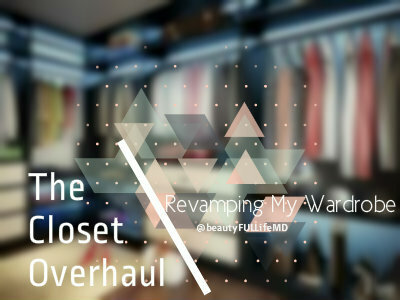 I’m overhauling my closet. I’m going to be as brutal as I need to be to get rid of things I don’t wear and don’t reflect what I’m trying to project. I’m a little bit of a hoarder when it comes to clothes, and shoes….and a lot of things, but I’m going to put an end to that! And what better way to do it than with a Blog Series. It will be called, you guessed it. And to start, I’m going to do a cleanse. Check back every other Friday to see what I’m doing to get to that goal of a great Wardrobe.